Motion Coordinator using a high performance ARM11 processor, with five flexible axis ports and four Voltage outputs. 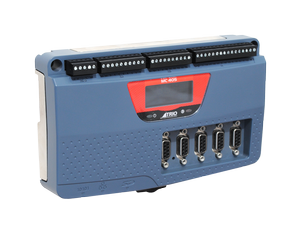 The built-in Ethernet port allows programming and connection of common HMI and PLC protocols directly to the MC405.The flexible axis ports can be configured in software as feedback devices or pulse direction outputs. As outputs they can be used as pulse and direction with stepper or servo drives or they can operate as a simulated encoder output. When configured as feedback they can be either incremental encoder input or one of three popular absolute encoder types; SSI, Tamagawa or Endat. Any feedback axis with a voltage output can be used to form a closed loop servo. User programs can be written in Trio’s established multi-tasking TrioBASIC language using the powerful Motion Perfect v3 application development software making complex motion easy. Also available as an option is the industry standard IEC 61131-3 languages allowing fully functional PLC programming system. A bright easy to read backlit display enables the controller status to be easily determined, while the single piece metal cast backplate provides an integrated earth chassis to improve noise rejection in the industrial environment.